Summertime is here and for most people that means summertime activities. Barbeques, pools, fireworks and lots of time outside are just some of the activities that many enjoy. However, for those of the Wicca or Pagan religions, this time of year means something more ceremonial. The Summer Solstice Sabbat, or Litha as it is referred to by Wiccan or Pagans, is the festival of the sun and the longest day of the year. With annual gatherings occurring around the world, people celebrate the crops in full bloom and the earth warmed by the sun. Beginning with the Druids and other Scandinavian cultures, many still honor this day with celebrations, rituals and sometimes just parties. Here is some information on how to throw a Summer Solstice Party whether you want to be traditional or just have a good time. 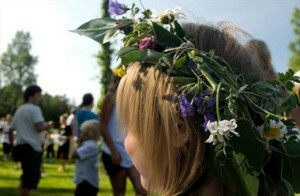 Summer Solstice Party activities can include barbeques, sparklers, live music, nature walks, etc. For more on the party side, you can serve Scandinavian foods, for the Druid influence, decorate the backyard with suns and anything nature themed including candles and ivy.